The DSArms Ultra-Light Enhanced Stock was designed with one simple purpose in mind, giving the end user a quality rugged stock that has all of the features and proven performance of the Mil-Spec M4 Stock turned into an Ultra-Light design utilizing Titanium and Aluminum materials. This Ultra-Light Enhanced Stock weighs in at only 173.6 Grams compared to a traditional M4 Stock which weighs 206.4 Grams. That's more than ounce in weight savings! The stock body is designed to fit any Mil-Spec buffer tube. The stock body is made from high-impact glass filled reinforced polymer. Slide Lock Pin is machined from DSArms HGTi High Grade Titanium. Slide Lock Pin Nut is machined from DSArms HGTi High Grade Titanium and features a black finish. Sling Swivel Screw is custom machined from DSArms HGTi High Grade Titanium and features a black finish. Machined Billet 6061 Aluminum rear sling swivel with a Hardcoat Anodized MIL-A-8625F, Type III, Class 2 Finish. 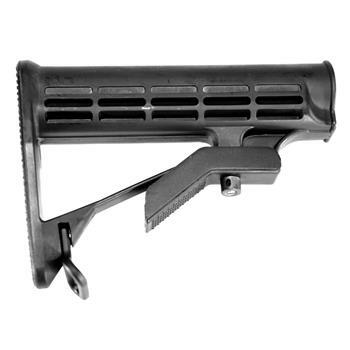 This stock is 100% U.S. Made By DSArms!